"Oh Macaroni!" has become one of Addie's favorite phrases lately. It seems to be an "Oh Da**" sort of thing. Yesterday we got the surprise storm of the year. I dropped the girls off at daycare (after winning $20 and a Christmas CD for winning radio trivia!) around noon. It was snowing pretty good, but we only had an inch or two. It continued snowing heavily all afternoon. It didn't take us long to pass up the predicted 3" of snow. It seemed that there was a line of snow created at the head of the lake that just kept dumping on us all day and into the night. By 2:00 I could barely get across the high bridge to Superior (and my office). By 3:00 Adam was calling me telling me to get out of the office and get back to the girls. They were closing down the bridges. At 3:30 I told my boss I was going home. At 4:00 I was finally able to close down my computer and go. I ended up leading a string of IT guys across the bridge because they didn't have 4 wheel drive and didn't know how to get across if both bridges were closed. 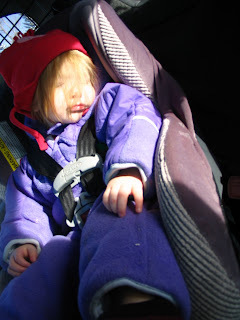 It took me 1 1/2 hours to get to daycare, which is usually a 30 min drive. As I was crawling up Thompson hill, I saw several semi's that were stuck or jack-knifed in the road. Once I got to daycare Adam called and told me both bridges were closed and the alternate way was almost white out conditions. I called our friends Dana and Jeff and asked if we could crash at their house for a bit. We ended up having supper and playing at Dana and Jeff's house for awhile. I called Adam at 7pm and found out that the bridges were open again. We headed back home, going 20 mph almost the whole way. It took me an hour to get home. All I can say is thank goodness we have such good friends who will just open their homes for us. I really appreciate their generosity and friendship. That weather was crazy yesterday. It's always scary to think about getting stuck on the wrong side of the bridge. Thank goodness for friends!